Llangrove Village Hall, HR9 6EX, is situated in the heart of the village, turning off the main road roughly opposite Llangrove CE Academy. It is a single storey wooden construction built in the 1950s and extended and modernised in recent years. It now has disabled facilities, a modern well-equipped kitchen and, in 2018, benefitted from a new roof and lighting supported by EU and Leader funding. 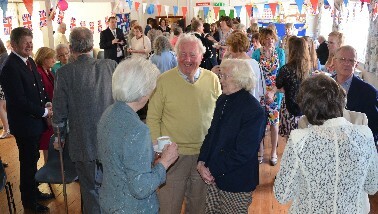 Throughout the year, the hall is well used by local groups and is also available for hire. Availability can be checked on the Llangrove Village Hall Calendar. The use of the car park for events other than at the Hall is permitted but a donation for hall funds would be gratefully received. A Safeguarding Policy statement of policy and procedures applies to users of, and activities in Llangrove Village Hall and any ancillary activities which are the responsibility of the Village Hall Management Committee. Llangrove Village Hall has been awarded a grant from the Herefordshire LEADER project, part funded by the European Agricultural Fund for Rural Development, for roof replacement, refurbishment and strengthening, together with new profiled ceilings and modern efficient lighting.